The very title of the book How to Win Friends and Influence People indicates that the presented topic is extremely important. Being a reader of a book under consideration, one may suggest that the main idea presented in the book is worth paying attention to. It helps to evaluate certain issues that prevent people from understanding each other. The book is like a bridge between misunderstanding and understanding that is constructed on the purpose of achieving some desirable effect. The author did not create a new perception of the concept of communication, but he managed to schematize and systematize it. We may regard this book as a letter to our consciousness, starting with the words “to me it may concern”. The book consists of blogs of information, which are emphasized with vivid examples that correspond to real-life situations that an average person deals with all the time. It appeals to the audience since it helps to learn something new and improve. The main ideas are shown from the point of view of the participant – every person may find himself or herself familiar with a described matter or identify somebody’s personality based on a given set of actions. The main point is that one can find a decision in every situation. This is the answer to the question “what is this book good for?”. treat the other person with the sense of importance. It is certain that these rules are shared by Dale Carnegie in order to help people be more socially involved and build good and reliable relations with each other. The author illustrates that all unpleasant moments can be avoided and cooperation can be pleasant and mutually useful in any case. From the list above, I, personally, am inclined to use the name of a person often in conversation so to be considered an attractive and interesting interlocutor. Additionally, I should listen, remember information from the previous talks, and be careful to details. This is how one may discover the desires of others to use them productively in the future. Carnegie implies that “appealing to the nobler motives” is the best way to achieve sympathy (Carnegie, 1981). The remembrance of previously discussed information appeals to everyone. For example, the Socratic method may be used, which is based on asking questions that stimulate critical thinking. Carnegie writes that if people work on the discussion based on common grounds (facts that are true for everyone), a consensus will be inevitably achieved (1981). It leads to the idea described in the book that it is better to avoid an argument and not to cross the boundaries of respect. One should respect, listen, and not express disapproval of someone or something. If one does not talk about the faults of others, he or she creates ways to motivate that person. All things should be done in a civilized society in such a way. All in all, the book under consideration teaches how to bring ideas to life. During this process, one can “win friends and influence people” (Carnegie, 1981). 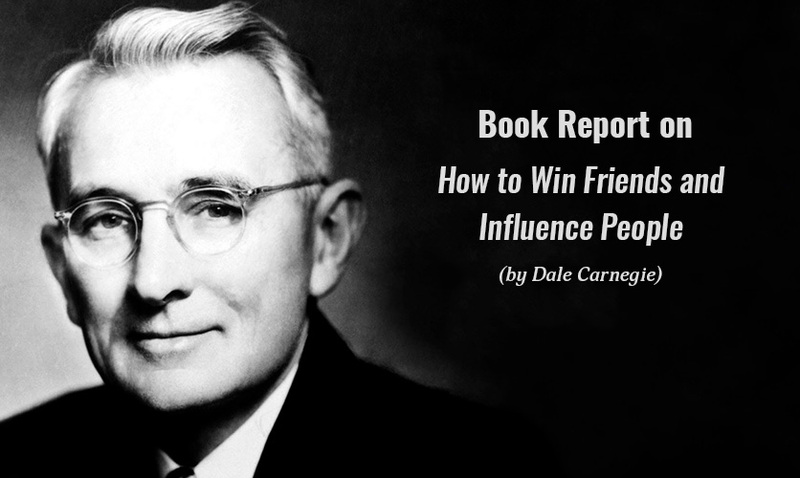 The most crucial point is that thoughts in the book of Dale Carnegie indeed have a form of successfully written notions that people have used during the history (for example, Socrates). It means that these things do really work and have positive results. The personal suggestion maybe knowing my wishes and desires of other people in order to make a place for practical realization of theoretical possibilities. Carnegie has managed to write a book that can be extremely useful for everyone. Carnegie, D. (1981). How to win friends and influence people. New York, NY: Pocket Books.